The textile traditions of Indonesia are no longer ethnographic curiosities. They are the material of couture creations that can take you from the beach to the ballroom and out on the streets of the world’s culture capitals in capital style. Not convinced? Just take a look at the chic ikat resort wear, above, created by Ratna Panggabean, one of the country’s most prestigious fashion designers and an outspoken evangelist for Indonesian textile arts. 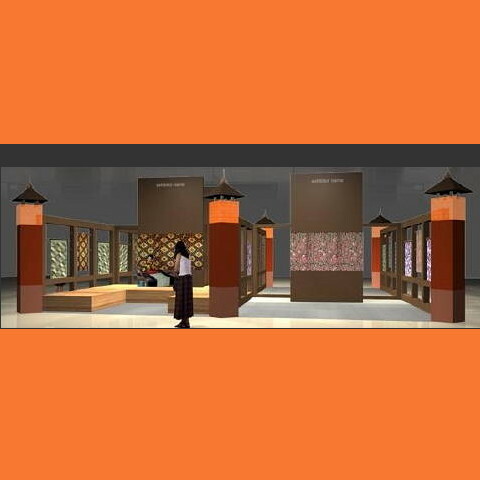 Then visit the annual exhibition of Adiwastra Nusantara, an organisation devoted to exposing and promoting the traditional textile techniques of the Indonesian archipelago. This year’s show is entitled “Beyond Fashion! Art to Wear” and will take place 15 – 19 April at the National Convention Centre in Jakarta. Premium exhibitor booths (above), were custom-designed for showing cloth and fashion. Over 200 exhibitors will be participating, representing a wide range of textile-related enterprises and organisations, from village cooperatives to international fashion houses. The exhibition program includes performances, fashion shows, textile weaving and patterning demonstrations, seminars and lectures. With folk-clothing inspired looks hitting the runways of Europe and America in a big way, this is bound to be a show that generates a lot of buzz, fashion inspirations, and networking opportunities galore.